CARROLLTON — Julie Johnson squinted at a map on her iPhone before walking up to the next house on her list. 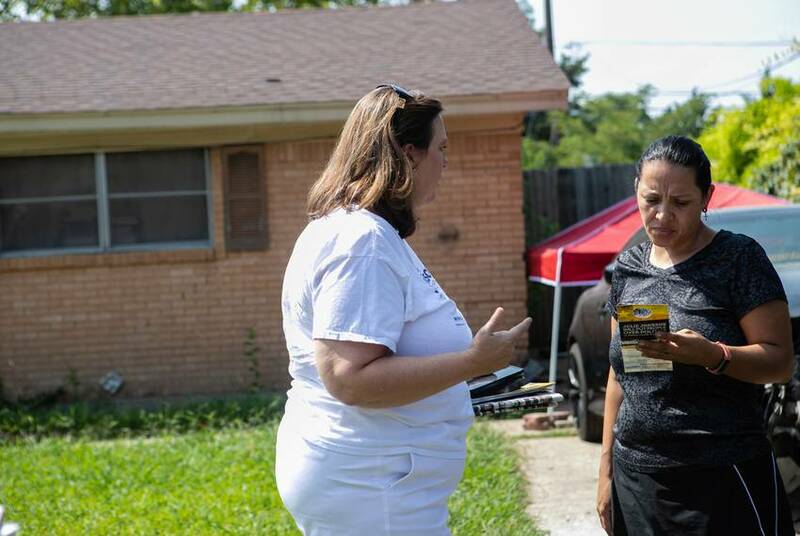 “Are you registered to vote?” Johnson, a Democratic state House candidate, asked a Hispanic woman standing in her driveway one morning in August. The woman wasn’t, she responded, but her mother was. Johnson is among several Democratic candidates in Dallas hoping national and statewide talk of a blue wave will trickle down to several local state House races. A mix of Democratic enthusiasm this cycle, along with a litany of well-funded candidates, has created a hotbed of competitive state House races around Texas’ third largest city. While some of these districts have drawn contentious matchups before, the fact that most handily went to Hillary Clinton in 2016 has only heightened the stakes. State Rep. Matt Rinaldi, a hardline conservative from Irving, has had perhaps the biggest target on his back since last year, when protesters descended on the Texas Capitol over the state’s new “sanctuary cities” law. Rinaldi said he called federal immigration authorities on the protesters, which angered some Hispanic House members. An argument on the House floor escalated to accusations of death threats and shoving, some of which was captured on a video that drew national attention. Rinaldi says that the incident hasn’t gotten much play in his district. “I think it’s come up once or twice,” he said over a breakfast sandwich at a McDonald’s in Farmers Branch almost two weeks after Johnson had mentioned the ICE incident to a constituent. Rinaldi, who was getting ready to deliver yard signs to supporters that morning, maintained he wasn’t the aggressor in that incident. Rinaldi, a lawyer, first won the seat in House District 115 in 2014 after he ousted Bennett Ratliff, a Coppell Republican, in their party’s primary by just 92 votes. The district is nestled northwest of Dallas; it stretches from Coppell to Addison and cuts through Farmers Branch down to Irving. The latest census estimates show that roughly 28 percent of the district’s nearly 187,000 residents are Hispanic — a community with traditionally low voter turnout that both Rinaldi and Johnson are trying to tap into. Johnson, who’s also a lawyer, is trying to cast herself as the candidate that will “be an advocate for all of our community.” She also regularly mentions the fact she’s a mother of two adopted immigrant sons. “I understand what it means to have your children come into this country and not speak English,” she said that morning in August at her campaign headquarters, where an “Immigrants Make America Great” poster was plastered to one of the walls. Volunteers and a number of local Latino elected officials had joined her there before kicking off another round of canvassing the district. Johnson refers to Rinaldi — a member of the Texas House Freedom Caucus, a hardline conservative group — as “one of the most hateful members” of the Texas Legislature – and someone who directly harms the district’s Latino community. A number of these state House districts widely considered in play were also part of a cluster of closely watched races in 2016 — including seats held by Anderson and Koop, who both managed to hold on. One district from that group went from red to blue in 2016 — and it’s now in a different category this cycle: It could flip back in the Republicans’ favor. State Rep. Victoria Neave, D-Dallas, unseated Republican Kenneth Sheets in a close election in 2016. This year, her re-election bid is complicated by her arrest in 2017 for driving while intoxicated. Neave is facing a challenge from Republican Deanna Maria Metzger, who aligns with the more right-wing faction of her party. 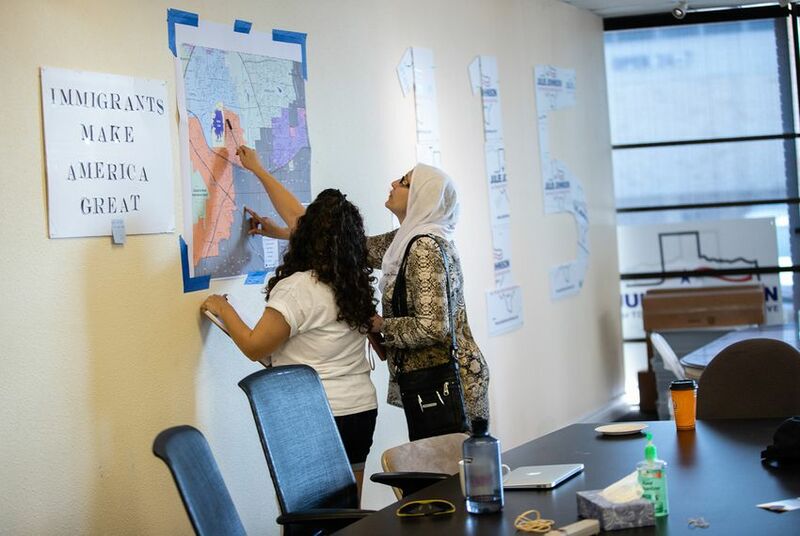 Dallas Democrats, meanwhile, are hopeful that excitement around two races in particular — U.S. Rep. Beto O’Rourke's bid against U.S. Sen. Ted Cruz, R-Texas, and Colin Allred’s campaign to unseat U.S. Rep. Pete Sessions, R-Dallas — may help candidates in these local races. Frustration with the current occupant of the Oval Office, party leaders say, is also expected to boost Democratic turnout. Meza, who lost to Anderson by just 64 votes in 2016, said her campaign is “building on a foundation we started” last time. Anderson dismissed such a notion. “We certainly don’t see it on the ground,” he told the Tribune earlier this month. 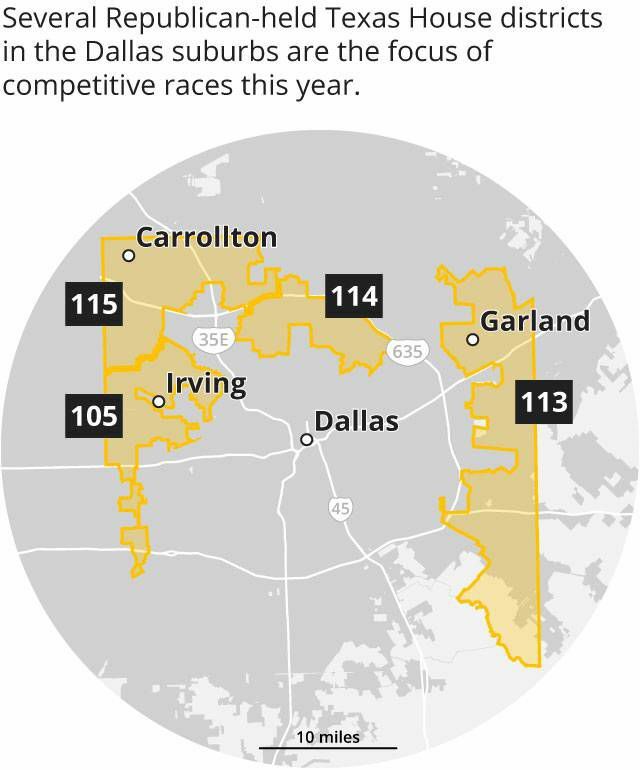 There are also two open state House seat races in the Dallas area currently held by Republicans that Democrats see as potential pick-ups. With no incumbent to rally against, both races have so far been relatively civil. Back in Rinaldi’s district, the Republican incumbent said he recognizes Democratic enthusiasm this election cycle — but that people here, for the most part, are happy with how Texas is doing. Johnson, Rinaldi’s opponent, described the optimism in her party this year as “a community awakening” of people realizing their vote can make a difference. Still, Election Day is roughly two months away, Emmert, the former GOP chairman, noted. “Who knows what the future has in store between now and November?” he said.